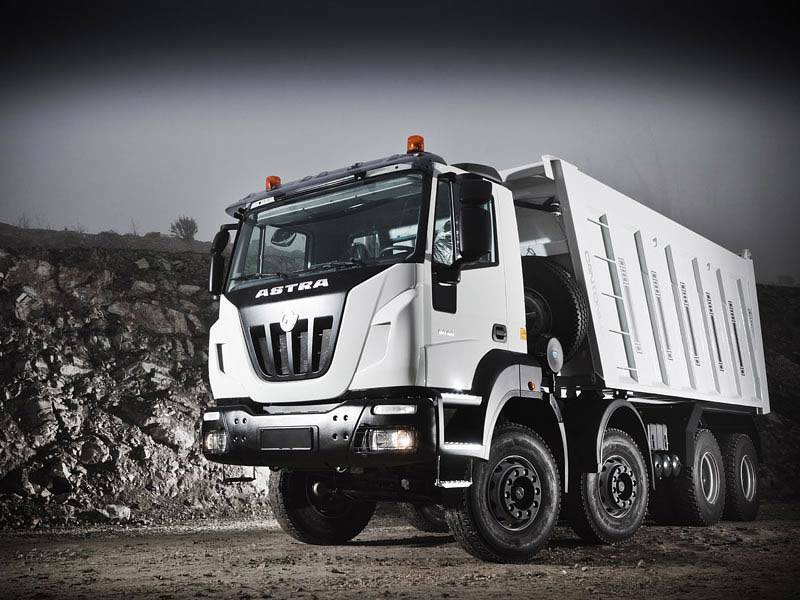 The Astra 8x8 is the largest and most heavy duty off-road vehicle available in the Iveco product line-up. It's unashamedly purpose-built to be totally functional and practical while filling the most demanding off-road applications. Featuring huge ground clearance, a full-time 8x8 system with lockable diffs on all axles and a choice of two powerful horsepower options, the Astra is a true workhorse and excels when road conditions deteriorate. The Astra is a serious off-road truck, purpose-built for the toughest off highway applications. 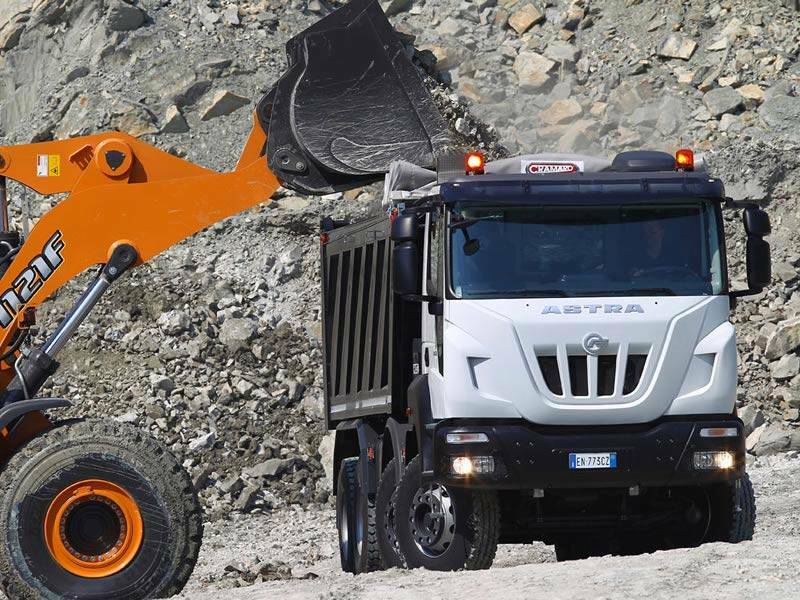 Boasting the traction of an all wheel drive 8x8 driveline, Iveco parabolic front suspension, Iveco cantilever rear suspension and the well-regarded Iveco Cursor 13 engine available in 480 or 520hp outputs, the Iveco Astra makes light work of the toughest conditions. The Astra is equipped with differential locks and hub reduction on all axles, and with its 48 tonne GVM and 70 tonne GCM is capable of handling the largest of loads. The Astra is fitted with the ZF Eurotronic II 16-speed automated transmission but is also available with optional Allison 4700 full automatic if the application requires it. The Astra is powered by Iveco's popular Cursor 13 - 6 cylinder, turbocharged diesel engine. In the Astra, the engine is available in two sets of tune: 480hp/2300Nm or 520hp/2400Nm. 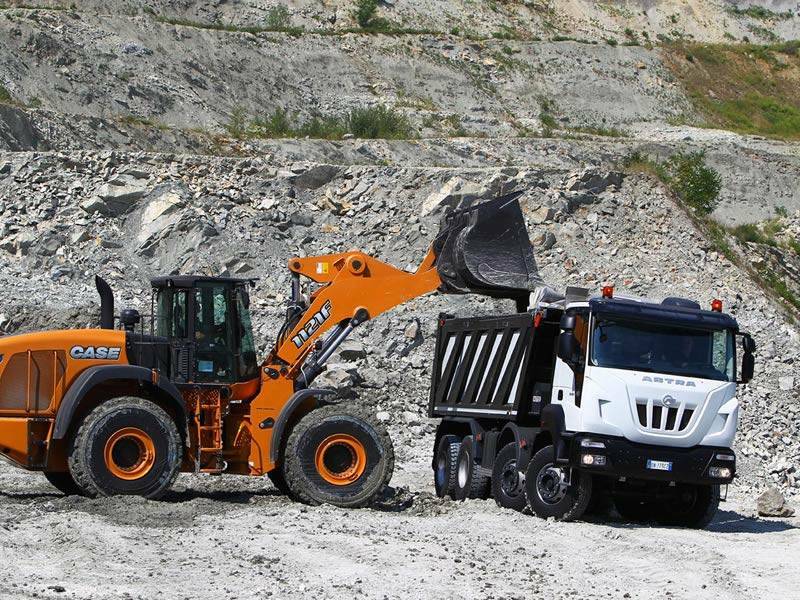 Both engines provide strong power and torque from low in the rev range ensuring the trucks can handle the demands of the most difficult applications. 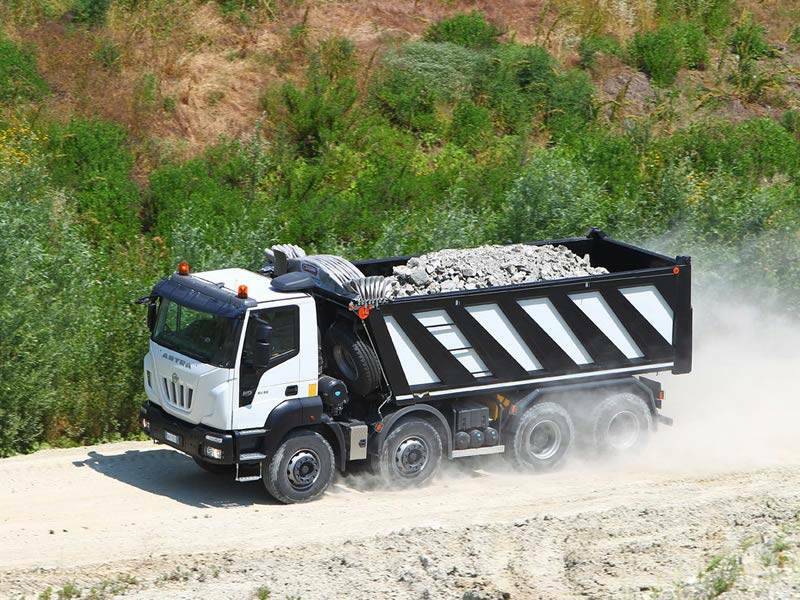 To meet the current Euro 5/ADR 80-03 emission standards, the Cursor 13 engine is fitted with Selective Catalytic Reduction (SCR) technology which reduces the level of toxic gases emitted from the engine and also provides a significant decrease in fuel consumption. Paired with the engine is the durable and intuitive ZF Eurotronic II 16-speed automated transmission which provides easy, stress-free driving allowing the operator the freedom to concentrate on the road conditions. The Astra is powered by Iveco's proven Cursor 13, 6 cylinder, turbo charged engine. It's available in two sets of tune: 480hp/2300Nm or 520hp/2400Nm for extra heavy duty applications. Both engines have ample power and torque available from low in the rev range to get the tough jobs done with a minimum of fuss. And with 48 tonne GVM and 70 tonne GCM the big Astra is well suited to carryout all the big off-road tasks. To meet the current Euro 5/ADR 80-03 emission standards, the Cursor 13 engine is fitted with Selective Catalytic Reduction (SCR) technology which reduces the level of toxic gases emitted from the engine, but also improves fuel consumption and increases the efficiency of the engine. Paired to the Cursor 13 engine is the ZF Eurotronic II automated transmission. The unit is a 16 speed transmission which has an electronically controlled clutch engagement. While driving in automated mode the Eurotronic transmission automatically selects the most ideal gearshift according to load, road speed, road incline, etc. The transmission also provides the operator with the flexibility to manually select gears should the application and track conditions require this. Should the application require a full automatic tranmission, operators can also choose the optional ALLISON 4700. The Astra's cab may look utilitarian and no-nonsense from the outside, but inside the cabin boasts many of the comfort and ergonomic features used in Iveco's road-going models. The cabin is spring suspended for extra comfort and features tinted electric windows, 4-speed ventilation and heating system with air recirculation, a detailed multifunction display and instrument cluster and ergonomically-designed dashboard. Further aiding comfort is the 3-way adjustable air suspended driver's seat. To aid functionality, the cabin is fitted with a compressed air 'quick coupling' for cab cleaning, internal cabin panels are also completely washable and fire-proof. The Iveco Astra is a genuinely tough and capable off-road vehicle, with permanent all wheel drive to all 8 axles. The Astra is fitted with parabolic front leaf springs and rear Iveco cantilever springs, providing an excellent load carrying ability, comfort and off-road performance. The suspension features a standard stabiliser bar on 1st and 4th axles. The Astra has a strong high tensile steel C-Section chassis, reinforced with cross members. With its flat chassis rails, the Astra is suitable for fitment of a wide range of bodies with minimum need for modification.